I can’t afford your books. 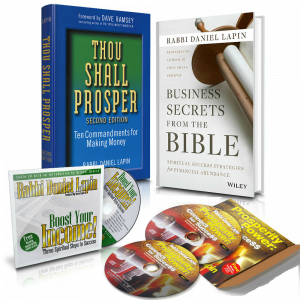 We appreciate that you recognize that our books have the potential to help you advance in your financial life. We think there may be a few preliminary ideas worth contemplating in advance of reading our books. It seems to us that you are asking for a gift of the books rather than for advice and we also know that unsolicited advice is difficult to accept, but we are sure that we can provide you with more valuable and more effective help this way. Please know that we care for you—if we didn’t, we wouldn’t have answered your question at all. We sincerely hope that our very real concern for you and for others in similar circumstances, will be the ‘sugar that helps the medicine go down’. 1. On a regular basis, we tidy up grammar and spelling mistakes in the questions that people submit to our Ask the Rabbi feature. We understand, and ourselves fall prey to, the lure of high speed communication. Unlike a handwritten letter that would be reread and often recopied with an eye to how it looked, our computers (or other devices we use to send messages) lure us into writing and clicking “Send” without a second glance. That is a luxury that anyone looking for a job, or a favor, cannot afford. You only get one shot at a first impression. Whenever we have a job opening in our ministry, we immediately discard any applications or resumes containing spelling or grammar errors. You are asking us to invest in you by presenting you with our material, yet your email suggests that you weren’t willing to take the time to present yourself at your very best. When you go for a job interview, dress, speak and behave in a way that is above the level for which you are applying. We are sure you could write a better letter, Desmond, which brings up point #2. 2. The twenty-eight words you wrote us reek of hopeless despair. One of the things most employers seek is a ‘can do’ spirit. We don’t know where you are based, but your letter did not explain that you tried to get our books from your local library or that you live somewhere without access to any such facilities. You didn’t mention offering to trade some work for a small bookstore in exchange for one of our books or using ubiquitous social media to try to swap something you have for one of the books. The way you phrased your short question leaves us wondering whether you did put much effort into accessing our materials. Our website offers a plethora of valuable and free teaching in the form of Thought Tools, Ask the Rabbi, videos and other material, yet you don’t indicate that you have made use of that or express gratitude to us for making it available. We don’t need the thanks as much as you need to cultivate an attitude of gratitude and appreciation. Nor do you mention how much time you have spent consuming information that you can easily access. Whenever you go for an interview or ask for a favor, you improve your chances of success if you show that you are familiar with the company where you are interviewing or that you have put effort into doing whatever is in your power to strengthen your case. 3. One of the four resources in our Income Abundance Set is a CD that retails for $10.95. At times, we have offered a download sale for $5. Our books, at times, have been for sale for $15. Can you honestly tell yourself that you are incapable of scraping together that much money? Are you the only one in your family or social group who would benefit from one of our books or could a few people perhaps chip in a few dollars apiece and share a book? Reading and discussing it with others would actually make it more valuable as a resource. Our ministry regularly donates and gives away books, CDs and DVDs. While we donate to people who we recognize truly have no way to acquire our material on their own, such as incarcerated prisoners, we more frequently give our material as gifts to those we see volunteering their time and effort to worthwhile causes without asking anything in return or to those who, while working for pay, go the extra mile in their job. The most important piece of advice we can give you is to take charge of your future. View yourself as the active ingredient in changing your life. Do not sit back and wait for others to save you, either through their generosity or through force of government. You can have a different future than your present circumstances suggest, but you are the person who needs to work hard and be creative and resourceful. Presenting yourself to others as unambitious and needy is not the road to success. We recognize that our answer is not what you had hoped for. We hope it doesn’t sound harsh and that our genuine desire to help you shines through. We do think that society and culture today encourage self-pity, a sense of victimization and laziness. We believe that the tough love approach is a more honest and successful pathway. We truly think that our answer provides you with an opportunity to change your thinking and your behavior in ways that will have you writing to us within six month letting us know that you have stepped onto the escalator of success. Indeed He did but He didn’t give it to the Jewish people exclusively! It just so happens that the Jewish people, over the fullness of time, have been much more attentive to His message of wisdom–The Bible– than most other folks. In other words, wisdom is not inserted biologically into anyone like nutrients through an intravenous feed tube, it is available in ancient Jewish wisdom’s unpacking of the Bible. This is the essential core of our work here–making this ancient Jewish wisdom available to eager and interested people of every background. Of course you can participate in the good deed of making some of this wisdom available to those who really are incapable of purchasing it. Please go to the DONATE tab above and give whatever your heart calls you to give to the American Alliance of Jews and Christians. Thanks for writing, Ruth. You didn’t give him what he wanted, you gave him what he needed. That’s priceless Rabbi. Well done. thank you. That is exactly what we tried to do. And, after all, it’s what we try to give ourselves too. I don’t necessarily want exercise but I do give it to me. I don’t necessarily want grueling study sessions, but I do give them to me. We hope Desmond leaps out of his chair and throws himself into transforming his life. Wow, that was a very generous “no” to a request for charity. That and I benefitted. that this was not a ‘no’ to a request for charity. It was a ‘no’ to THIS particular request for charity. We would not rule out a possible later gift should we determine that Desmond is a worthy recipient of our charity. We are morally obliged to distinguish between worthy recipients and unworthy in order to be good stewards. So far, we have inadequate information so we err on the side of responsible stewardship. I love the thoughtful way you responded to this gentleman’s question. I am a holistic health coach and I have priced my coaching and resources very affordably because I do want those who truly need my help to be able to get it. However, inevitably have people reach out and tell me they can’t afford it and hoping I will just “give” them my help because I am a Christian and I suppose they think I should do that. I appreciate your response so much. If we are not willing to invest in ourselves and to see ourselves as worthy we can never fulfill His call on our lives. Happy to have you as one of our readers. Fantastic reply! Thank you for speaking the truth in love. This response benefits us all. This response is perfect! I am a “millennial” myself, and I am constantly appalled by the lack of effort my generation puts into their writing, their work, and sometimes, their families! There are exceptions of course. I have a dear friend who is very dyslexic, and though he does his best, his writing is similar to that of a grade 2 student. He certainly makes up for it though in his strong work ethic! I am new to your website and materials, my husband and I have started to read your book and are realizing just how many mis-truths we have bought into! Thank you for this response, I do believe it was timely and accurate. Thank you for your kind words. We know many employers who eagerly hire people with handicaps such as dyslexia because of the work ethic and zip they radiate. Happy to welcome you as a new reader and some time, when you have a minute, we’d sure love to know how you encountered us. That really helps us. I do think you nailed the issue, Rabbi. However, on the off chance that the gentleman is in similar circumstances to myself and wants a more reliable way to find your books, I would point him to amazon’s used books. Often I can find books I want for not much more than the cost of shipping that Amazon requires. SOme months I can not afford even the 1cnt plus $3.99 shipping…. but I can put whatever book it is in my cart, and hold for later so that I can keep track of it easily. thank you. We have absolutely no problem with people reselling our resources and other people buying those 2nd hand resources. They are just as helpful when reread or relistened to by new owners. As long as people obtain them and use them. That is our main interest. Thanks for writing and now, what will make our cup runneth over is if Desmond himself would write and thank us for speaking the truth in love. I am in a similar situation. But by simply listening to you, Rabbi, on the SilentJim podcasts where I first learned of your teachings, and on your own podcasts, I understand that I will buy your materials as soon as I make enough money to get all our bills paid. Based on suggestions in those podcasts, I have started an “online bookstore” by going through my bookshelves here at home, and listing sellable books on Amazon and eBay. I have sold a few, enough to know that this is going to succeed. While I have had to spend most of the profits to keep our utilities on, I have been reinvesting as much as I can in buying used books at local thrift stores. I am also asking family, friends, and neighbors to check their shelves for unwanted books, and offered to sell them for a commission. A couple have donated books to me. Books don’t typically sell the same day you list them online, unfortunately 🙂 It looks like it could take a year or more to get this to the point of supporting my family. But after years of health problems that prevented my doing even something as simple as this, at last I believe I can see a tiny flicker of light at the end of a long tunnel. Yes, I’m tempted to fall back into discouragement and despair; often several times a day. But I believe God has caused me to stumble across these podcasts, and shown me one avenue to getting back on my feet. So I’m reminding myself of that, and the discouragement fades away. I would love to have your books and audios right now. No doubt when I have them, they will accelerate my success. But I’m on the road to obtaining them. Crawling, perhaps, but soon I’ll be taking short, shaky steps, and sooner than later, walking! Desmond, take a look at the My Silent Team group on Facebook. It was set up by “Silent Jim” Cockrum. There are some 33,000 members. He and they offer all kinds of free advice on how to get started and become successful by selling online. *Not* just books, but most anything. You’ll learn how to find products that will actually sell, as well as how to sell them, step by step. These people are so incredibly helpful, gracious, encouraging, kind, and generous. Just go look at posts there a few times a week, you’ll pick up ideas, and come away feeling hopeful. 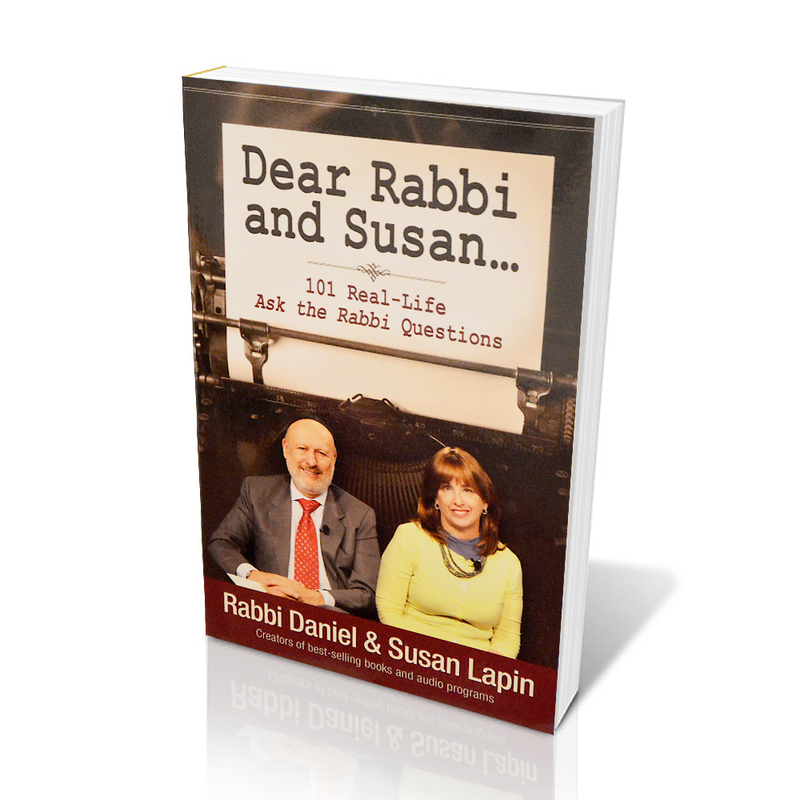 Rabbi and Susan, thanks for your podcasts and emails! I thoroughly enjoy them and learn from them. And soon I’ll enjoy your books and CD’s!! Also, Desmond, I implied in my post, but should have said implicitly, that listening to Rabbi Lapin’s podcasts is absolutely invaluable. I am listening and re-listening several times per week. Please listen to them, you will gain a lot of wisdom and practical, useful knowledge! The current show is entitled; Make God Smile By Looking After Your Stuff Whether It Is a House, a Car, or Yes, Even a Dam! yes, we’re also fans of Jim Cockrum who does so much to help eager and ambitious people find their financial footing. I have worked with him several times with great pleasure and hope we’ll collaborate more. I’m happy the podcast I did with him helped you find us. Honored to serve with you my friend! You’ve helped me in so many ways. Yours is the only “can’t miss” podcast on my list! I was orphaned at age 8, in and out of orphanages and foster homes until age 12 and homeless until age 15. My life was not in a good place & someone took me under their wings and gave me the same type of advice you did to this person. I am so glad that I was given the tools and answers I needed not what I wanted! Many years later I look back on those ‘life lessons’ and realise the wisdom sown into my life . Gratitude still prevails in my heart to the people who helped me get the skills to become self reliant ! Because of our close personal friendship, which I cherish, you know that I know your entire inspiring story of personal and financial salvation. I am pleased you wrote because among our huge number of readers , are many in desperate need of the encouragement and reassurance that your comment offers. Additionally, your work in the UK has done an enormous amount for helping so many people get onto their feet financially. I am a big admirer. Excellent advice Rabbi! Please allow me to add something valuable from personal experience. Following my own building business failure during the Carter Administration when mortgage interests shot up to 19% I moped around looking for any job I could find. I had my own mortgage payment and a spouse and two children to support. My depressed demeanor must have projected “Loser” as I was turned down continuously. Finally I was hired by a growing company for an hourly wage of $7.00. Wondering how in the world I would possibly make ends meet on that pittance, I began to ponder what I would need to do to get a reasonable increase in wages. Finally it dawned on me that this job wasn’t all about me, it was about the company, and I had to strive to do things to help make the company more profitable and come up with ideas to help lower operating costs. I began to get bumps in pay and it wasn’t more than a few years before I became manager of one of their stores with a comfortable salary and benefits. The first thing one has to realize is that the prospective employer already knows you need a job so don’t say that you are looking for a job, the company isn’t there to provide jobs for people and only hires those that they feel will somehow become a positive source of enhancement to the company. There are a few things one has to project to HR personnel during a job interview. Show up sparkling clean looking like the type of person they would prefer to hire that would fit into the company’s projected image. Present yourself as a “can do” type of person with a “whatever it takes attitude” and make a point of indicating that you are interested in knowing more about the company, how it operates and what you could do to help make it better and more profitable. Following this advice will make it hard for any HR person to say sorry. What an inspiring story, Mark. Your advice is excellent and spot on. Unspoken was your understanding that getting out and doing something, even if not what you ideally hope to do, beats sitting home and being depressed. Mark’s story conveys exactly the right attitude. He even downplays the terrible anguish he must have been feeling and his heroic struggle to surmount the pessimism and radiate a positive image. Not easy but doable. This is the best thing I have seen all day! Thank you for taking the time to speak some truth into this man’s life. I’m an engineer and I text in complete sentences with correct grammar. If I’m putting my name behind it, it has to be perfect or at least my best. That is a winning attitude, John. Engineering teaches you that the small details matter a great deal. As we remove hard science, higher mathematics, diagramming sentences etc., from the educational system, we do our students a disservice by failing to teach them that very lesson. Everyone knows that in the real world of engineering, loose tolerances doesn’t work. If a submarine hull needs to withstand a certain pressure, then it must be built to those specs–exactly. Casualness kills. In communication both written and verbal, no less should be expected of ourselves. Well said! Excellent advice. Thank you on behalf of all of us who see in ourselves a tendency toward weakness in whatever area it may be as this applies to so many of them. It reminds me of your CD describing entropy. We must be diligent to strive toward excellence rather than sliding toward poverty or mediocrity of attitude and action. Sadly, the cultural conditioning often prevalent in this country is that of financial poverty being an asset toward acquiring assistance financially without considering the need for spiritual assistance. Without addressing the entirety of man’s heart, mind and body as needing assistance, a void is left when attempting to satisfy one’s needs through financial means only. May we recognize that fallacy when it comes knocking at our door and indeed stand strong against the temptation to elicit sympathy in whatever form it may take as it seems that none of us is immune to it. Elizabeth, when President Trump won the election, we thought that one of the main contributing factors was that the Left doesn’t understand the difference between giving someone money, food, housing, insurance and other needs and allowing conditions to exist under which that person can acquire those things for him or herself. It gave us great hope for America that enough Americans did understand the soul-sucking nature of getting assistance, even when it is disguised as an entitlement. Seems like you hit a vein and helped a few more folks then expected. As always- thanks for the moral courage. We are blessed by never knowing exactly who and how many we are helping. We always pray for those numbers to increase even if we never find out about it. I won’t deny that we feel enormous gratification whenever we do hear from people who have been lifted by the ancient Jewish wisdom we make accessible. Sad that these days it does take courage (because there is often real risk and cost associated with truth) to speak truth. But we are encouraged by readers like you. Thank you. Sounds more whining than asking solutions to me. Many times I have similar requests from Homeless. I offer employment in the form of picking up the street or parking lot. Some take me up on it, and those who don’t aren’t very hungry…….BIG HUGS to U and YOUR WIFEY…..
We have had the same experience, Carl. Of course, mental illness is a big part of the homeless problem in America. Lumping everyone together does a disservice to those who truly need a helping hand and are eager to work hard and get back on their feet and to those who need medical care. Well and appropriately said. Thanks for this example of compassionate boundary-based leadership. Thank you, Shifra. We have stopped being surprised (though we are still shocked) at how much of what we would term “common sense” is so uncommon. Rabbi, you taught Desmond “how to fish” ; I pray he isn’t so insecure, insolent, or immature to appreciate the lesson and reap its benefits. I for one am going to copy and paste this response to my college student who needs a little push in the right direction. You have said all that needs to be said such much more succinctly than I ever could have myself! Thank you. How wonderful that you have the opportunity to influence the next generation. They are lucky to have you. Tough love…..something not practiced near enough. You were kind, but firm; I hope he took the lesson to heart. As weak parents and weak politicians discover, handing out goodies (especially if they’re someone else’s goodies) feels really good. But, and it’s a big but, the bill always comes due because it ultimately hurts the prospects of the recipients. Thank you both. This really helped me. I see a great example of the Father’s love in your words. I teach in a UK primary school. The prevalent political attitude towards conservatives is that they are mean and selfish capitalists (read ‘thieves’). I very much appreciate your demonstration of how to word our views in such a way that the true heart of the message is plain. God bless you both. Thank you, Byron. We have both read a fair amount of Theodore Dalrymple’s work on the attitudes that have become prevalent in the UK. Probably, like America, there are different communities with different values. Wherever you teach these days, however, you have your work cut out for you. It is so important to influence the next generation. Truly holy work. not all readers realize that we collaborate on everything we publish and each Ask The Rabbi feature is as much a product of Susan and my collaboration as are our children. So we smile when some address only me or only Susan–but we don’t mind; we know. Well, I am not made of money either, but I invested in your entire library package, and much to my delight! To that I would wish to add, as you yourself intimated, dear Rabbi, in an episode of Ancient Jewish Wisdom on TCT once upon a time, that Planet Earth is full of struggling authors trying to strike a foothold on the perilous cliff of public recognition to ascend the heights or even merely to make ends meet. Few succeed in such a treacherous craft, especially in an era when most folks have their attention spans stunted and reading and writing skills decimated by electronic media. You yourself deserve all the recompense you can get, and more, from your inspired efforts to share your Ancient Jewish Wisdom not just among the Hebrews, but with the entire world. Any author by definition has a message to share with the world and deserves a hearing. Above and beyond this, nobody will ever know what anguish, pains and travail you suffered to put these revelations at the world’s feet. I salute you and Susan for this undertaking. I wish I had heard your messages some forty years ago. Don’t we all, every one of us, wish we knew when we were younger what we now know today! This is true particularly in the areas of male/female relationships and finance/money. Which is why we encourage our friends to make sure that the young people in their orbits, whether biologically related children or young people who can be influenced, to expose young people to these teachings so that they perhaps won’t have to say further down the road, I wish I knew this 20/30/40 years ago. As a member of The Church of Jesus Christ of Latter-day Saints (the Mormons) I think you’ve captured how we feel about welfare as well as I’ve ever heard. For a few years my Church asked me to serve as a Bishop of approximately 500 young single adults. During that time I had the blessing and weight of determining whether to provide assistance (monetary or in the form of commodities) to those that approached me with needs. I realize that I wasn’t always perfect in my judgements on who and who not to give welfare help. However, I did try to teach the principles that you have shared but you just said it better than I ever did! Goes to show that Mormons also can greatly benefit from having a Rabbi. Thanks for the wisdom. How many times do I need to say ( https://soundcloud.com/rabbi-daniel-lapin-show ) EVERYONE needs a rabbi!? Since when doesn’t ‘EVERYONE’ include LDS folks in Orem? Well, I’m pleased you’ve gotten it now. Seriously though, we all teach how important it is to give charity. And it is. But we also need to learn and teach when NOT to give charity, let alone HOW to give it. Government hand-outs, entitlements, and welfare programs are all a good guide to how NOT to do it. Since we do not know Desmond’s background, we do not know his educational level, his past experiences, or even his age. He could, for all we know, be a victim of horrible abuse with little education who has reached out for help and been rejected, perhaps many times. I grew up believing that God and knowledge of God are not exclusive commodities to be sold by anyone blessed with knowledge and the ability to share that knowledge. I still believe that those blessed by God with knowledge of Him have a responsibility to share that knowledge whether that knowledge came from a closeness to Him, life experiences, intuition, etc. or book learning at the feet of religious teachers. Anyone charging for their knowledge is a charlatan or false prophet in my book. Example: TV preachers who spend most of their time on screen begging for money to “continue their ministry” yet they “teach” no more than a handful of the same things over and over. Raised as a Catholic I was very aware of the claim that Jesus told his followers to go out and preach and not worry about provisions and I believe this is what led to the “poverty, chastity and obedience” vows taken by priests and nuns. So, it seems especially evil when religious leaders operate on a business model to become rich rather than bring God and individuals together through freely sharing their book knowledge and personal experience. I do not know Desmond, but I have to wonder if he has some of the same feelings as I based on similar experiences and training. Forgive me for being blunt, but he may assume you could be yet another rich religious leader holding back blessing others with your knowledge until you see the money. In fact, that’s how I read the “tone” of his question even through his uneducated, uncouth way with words. Now I’m not supposed to call anyone rabbi on earth, so please forgive me. You come across as a sincere gentleman who usex the title rabbi to let people know what you can do for them, and so that they can find you more easily in the information jungle called google. Well I will have to let my personality shine through at this moment. Can I just say brother Lapin preach! I loved, loved what I just read. I have been listening to your podcasts for a week. In a month I have to put myself out there on the job market and while being my husband’s unappreciated maidservant all these years has not contributed to me developing a confident personality. On the contrary. He can be very demeaning and just outright nasty about 90 percent of the time. He has good points. But they are lost in the many slurs he hurls at me. It is a tough period and as you phrase it, I could use some massaging with warm butter (I fell off my chair when you said that at a christian seminar). I really appreciate your personality, the things you do and can I just say I am glad you exist. To which I’m sure your radiant wife should be credited for as well. I am at a point in my life where I have to be brave and find a way to create happiness myself with what God gave me. I have little emotional support from around me, which is something I really thrive on. So I will try to be my own big supporter. I go to God but I feel like God just directs me to the mirror and says: ”woman, get off that chair and be what you look for in others”. So that’s what I will do. Sincere blessings to you and your family sir, it is really encouraging to go listen to your podcast.